Hathaway Pool Table Billiard Accessory Kit. Product Dimensions: 31.5 x 14.5 x 2.8 inches ; 10 pounds. 16 precision-engineered regulation size 2-1&###x2F;4 in. Aluminum bridge head w&###x2F;two-piece bridge stick. This premium Billiard Accessory Kit contains all the essential billiard equipment needed to get you playing the right way. The 16 regulation size true-roll billiard balls combine quality materials and precision engineering to create a durable, perfectly weighted, ball that plays excellent. The racking triangle is crafted from durable composite plastic with a smooth molded shape. Two 57-inch two-piece cues have stainless steel joints giving you a straight cue over the length of the stick. Completing this kit is a two-piece bridge stick with an aluminum bridge, two pieces of cue chalk and a rail brush. The item "Hathaway Pool Table Billiard Accessory Kit" is in sale since Wednesday, May 9, 2018. 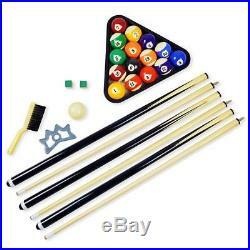 This item is in the category "Sporting Goods\Indoor Games\Billiards\Accessories & Décor\Ball & Cue Racks". The seller is "grt_deals" and is located in Lakewood, New Jersey.